Just as some people think glasses weaken the eyes, this question gets asked all the time; it’s one of the reasons my own father was so reluctant to originally seek treatment for hearing loss. So, do hearing aids cause hearing loss? The short answer is no, but keep reading and I’ll explain some of the most common misconceptions surrounding the use of hearing aids. Hearing aids operate by amplifying sounds as they are processed. This of course results in those sounds being heard more easily. It seems logical then, that after the first few weeks of wear, people take their hearing aids off and think their natural hearing ability has decreased. This is because for years, the brain has tricked itself into thinking the previous hearing loss was normal. But the fact of the matter is, the sudden appearance of new sounds makes you more aware of the sounds you have been missing out on. The new frequencies that become audible through the hearing aids may not have been heard for years. 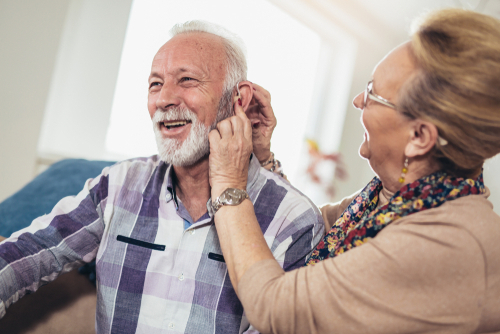 Since you are now hearing previously unheard sounds, removing those sounds when hearing aids are taken off becomes way more noticeable than before. The old normal becomes insufficient and the perception of worsened hearing is just that, a perception. Rest assured, hearing aids are not making your hearing worse. When hearing aids were first introduced, this was a major complaint, but like all technology, hearing aids have advanced exponentially. Not so long ago, people only had the option to adjust the devices up or down, without the precision we have today. Today, however, hearing aids are adjusted to match each user’s specific needs. Some even adjust automatically based on the surrounding aural environment. The idea that hearing aids damage eardrums, further worsening your hearing, is a myth. If you’re still nervous, don’t be lax when it comes to seeing an audiologist because scheduling regular follow up appointments will assure your hearing aids are at the right levels. It’s also worth noting that the idea of loud sounds damaging eardrums could be attributed to people mistakenly thinking personal amplifiers are hearing aids. Although they look similar, personal amplifiers are not hearing aids. Personal amplifiers work by using a microphone—amplifying sound directly into the ear. They are meant for temporary use in very specific situations. Personal amplifiers can damage the eardrum because they are literally amplifying sound into the ear. The harder of hearing someone is, the louder they’ll turn up the amplifier. The FDA even released a warning saying that people with hearing loss should not use personal amplifiers. Conversely, hearing aids are tailored to the wearer and are intended to compensate for impaired hearing rather than simply amplifying noise. Just like the idea that glasses cause dependency, this is not a great argument for refusing to use them. While it is true that hearing aids do not completely halt the progression of hearing loss, wearing them does slow it down. With hearing loss, certain auditory nerve cells do not receive stimulation. Without stimulation, the nerves are weakened past the point of usefulness, but hearing aids provide that stimulation. They heighten otherwise unheard sounds, which exercises the nerves and allows the brain to process them. As you can see, hearing aids do not cause hearing loss. The most common misconceptions adding fuel to this idea are all easily disproven. The use of hearing aids will not only slow down the loss of your hearing, but will improve the quality of life while doing so. If you are suffering from hearing loss, talk to an expert today about what your next step towards improvement can be. Max Gottlieb is the content manager for Senior Planning. Senior Planning is a free service for seniors and their families—helping them apply for benefits, look for care, or transition into long-term care settings.